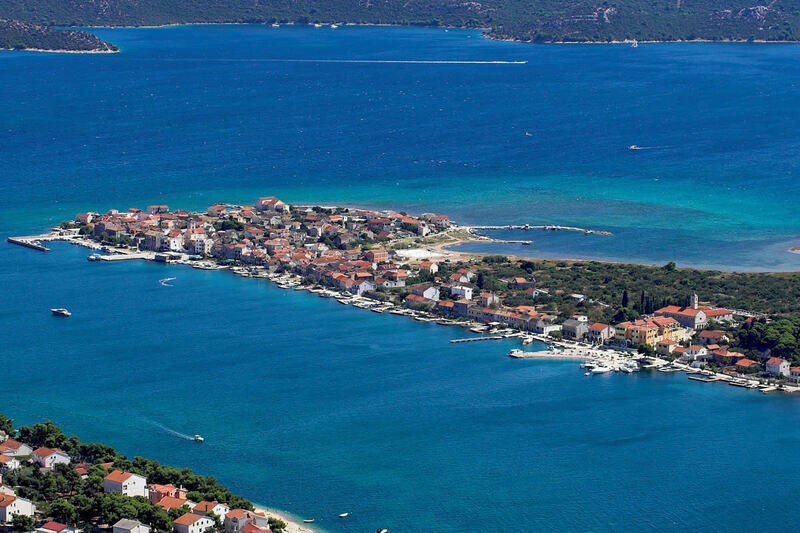 With its flat surface, the island of Krapanj is the lowest as well as the smallest island on the Adriatic Sea. It is located in the Sibenik aquatorium and only 400 meters away from the land. The island surface does not exceed the height of 1.25 meters above see level. During the 1960s, it was the most densely populated island on the Adriatic with more than 1,500 inhabitants. 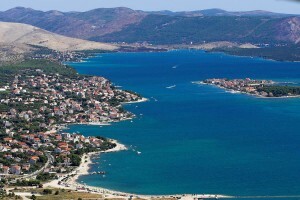 The island of Krapanj covers the area of less than a half of a square kilometer. It was not easy to survive on such a small area because the cultivable parcels of land were very rare (the area was thickly intertwined by dry walls forming parcels of the size of small gardens). The tradition of sponge harvesting and processing has been nurtured on the island of Krapanj for centuries. 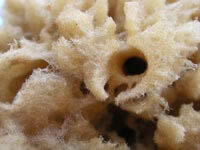 The Adriatic Sea sponge is precious for its quality and beauty. If you want to spend a peaceful and quiet holiday, the island of Krapanj is the perfect choice for you. Its gravel beaches are suitable for children and if you rent a boat, you can explore the surrounding coves and beaches. 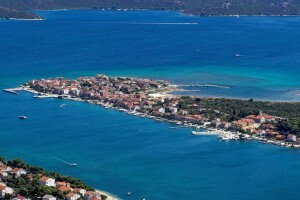 Krapanj is an island of the Sibenik archipelago, located only 400 meters from the land and separated by a wide channel. 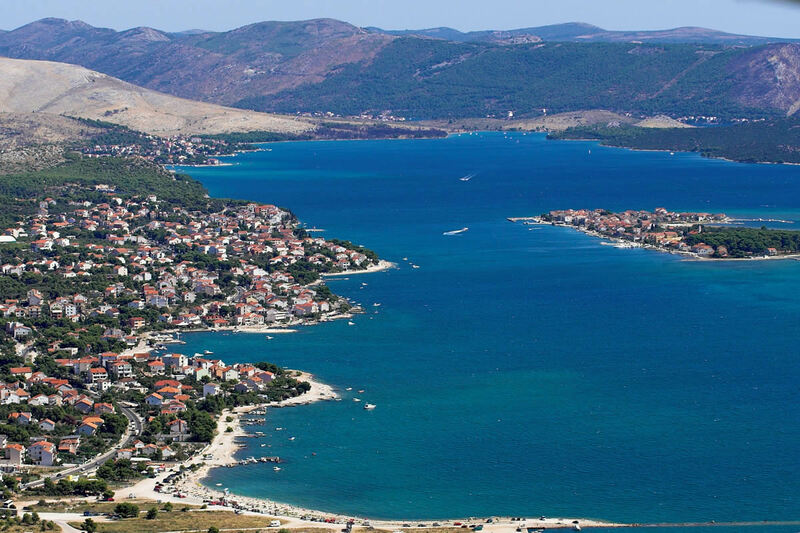 The ferry line from Brodarica, a village located along the Adriatic Coastal Road and only 5 km away from Sibenik, operates daily through the channel connecting the island with the land. Hotel Spongiola is situated on the small island of Krapanj and is only 400 m away from mainland. There is no vehicle traffic on the island. Arrival at the dock in front of the “Zlatna Ribica” restaurant or at the dock Krapanj, 150 m away. There is a ferry line from the dock Krapanj. Cars can be parked at the guarded parking-lot 3km away from “Zlatna Ribica” restaurant. By calling HAK (The Croatian Automobile Club) at +385 1 4640 800 you can obtain the information about situation on roads, fuel prices, highway tolls etc. By calling phone number 987 you can require repairs of the vehicle failure on the road, removal and transportation of disabled vehicles and vehicles damaged in car accidents. These services are charged according to the HAK price list. The flight schedule can be found on the web site. Island of Krapanj is connected with all major European towns via Sibenik train station. The train schedule can be found on the stranicama Hrvatskih željeznica . The sailing schedule can be found on the web stranicama Jadrolinije . It is believed that the island of Krapanj was named by the Greeks after the Jadrtovac Mud (gr. Kopranon), where the people of Krapanj still have vineyards. Another legend says that in the time of high tides, when the sea used to flow into the cellars, the island was completely under water. When the sea withdrew, the edges of the island were left in mud. Before people began to settle the island, Krapanj was covered with green woods and, according to old documents, it was considered the pride of the region. It used to belong to the Church of Šibenik and was later sold to Toma Jurić, an aristocrat from Šibenik. He started a construction of a chapel on the island.The construction of the chapel began in 1436 after it won the approval from Pope Eugene IV. In his will of testament, Toma Jurić left the island to the Franciscan friars. His five sons met with Franciscan friars on December 5, 1446 to discuss the fate of the island. It was agreed that construction and pasture on the island were not to be allowed, and that the land was not to be sold or bestowed to anyone. The Church of the Holy Cross on the island of Krapanj was sanctified in 1523. The settling of the island of Krapanj began with the invasion of Turks, when people were forced to seek refuge in the safer regions. Already in 1500, there were 200 small country houses on the island (according to the Villages of the Šibenik Region, by Krsto Stošić). Since they settled on the island with no source of drinking water, with no pastures or cultivable land, all of which is needed to lead a normal life, the newcomers started turning to the sea to ensure their survival. The legend says that a certain friar Antun, a Greek from the Island of Crete, taught the inhabitants of Krapanj how to harvest sponges in the beginning of the 18th century (around 1704). He also brought the art of sponge processing to the island. The harvested sponges were exported to Venice at that time. 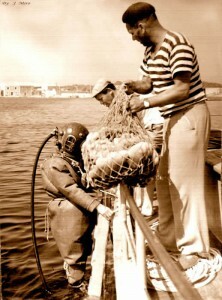 The sponge harvesting was first done by harpooning from the boats, a technique used by some of the sponge fishermen of Krapanj until the 1960s and 1970s. Such skilled sponge fishermen are very rare today, but there are also no sponges to be found at the depths that you can see and where the harpoon can reach. 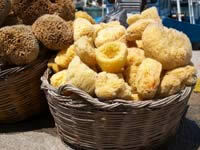 Sponge harvesting was the exclusive and profitable activity of the inhabitants of the island of Krapanj. For this activity, they used fishing boats weighing 4-5 tons and until 1893 they harvested sponges exclusively using harpoons; they could reach the depth of 15 meters under water. Each boat had a crew of two men: the harpooner locally called “svicar” and the rower locally called “sijavac”. The yield was divided between the harpooner and the rower. The harpooner used to get half of the yield, the rower and the boat each a quarter. If the harpooner also happened to be the owner of the boat, he was entitled to two thirds of the yield, and the rower to only one. Harvesting with harpoons was not the most profitable way of sponge harvesting since it was possible only when the sea was calm. Besides, the sponges were damaged by the harpoons and, as they were scraped off the sea floor, the new generations of sponges were destroyed in the process. During the Austro-Hungarian Monarchy, the government in Trieste made efforts to promote the sponge industry. In 1893, it presented the sponge cooperative in Krapanj with the first diving apparatus and a new one in 1896. This caused a conflict between the harpooners and the sponge divers. Since the ancient times and the very beginnings of the sponge business in Krapanj, the sponge fishermen from Krapanj had gone through various crises. The main cause of these crises was the limited number of sponge beds, the fact that was especially marked at the time when diving apparatus and motor boats were first used in sponge harvesting. The area where the best sponges could be found is limited. With the application of the new diving equipment, the available resources were soon used up. During the years before the Second World War until the 1950s and 1960s, there were 15-20 diving teams in Krapanj comprised of 7 or 8 team members. In 1956, the fate of the sponge business on the island of Krapanj was almost sealed. The sponge fishermen had committed to a project that proved to be a failure. Six equipped teams left on a sponge harvesting mission along the coasts of Egypt. After this effort had proved unsuccessful, and the teams had returned home, the “Spuzvar” Company was shut down. 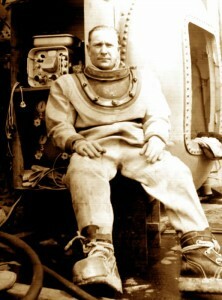 The number of sponge divers started to decrease rapidly so that in 1968 there were only 11 of them. The sponge business in Krapanj reached its peak of prosperity in 1912 when it used to sell up to 400 000 sponges to Italy, France and Germany. 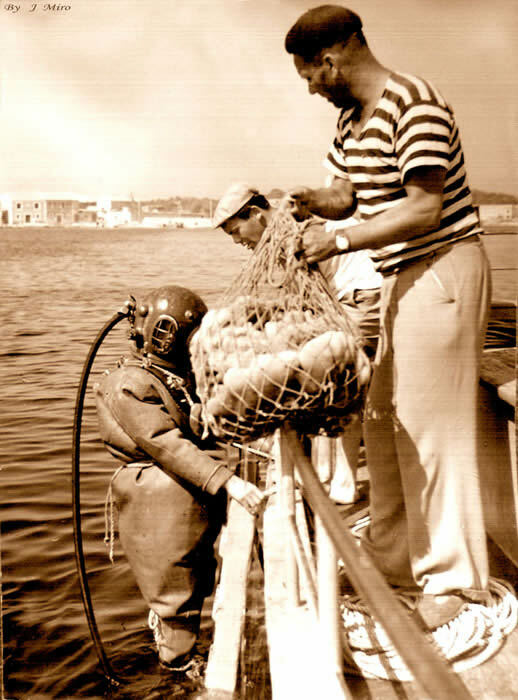 The Spuzvar Company employing 32 sponge divers was established in 1946. Comprising 10-12 teams, the company sponge divers went regularly on sponge harvesting expeditions. Apart from that, the Brodospas Company from Split used to employ 16 sponge divers from Krapanj; three Krapanj sponge divers used to work in the Split Maritime Affairs Administration; and 21 divers used to work in maritime construction companies along the Adriatic coast. There are five teams of sponge fishermen in Krapanj today and another three in Brodarica and Zaboric. There are two or three teams working in other areas of the Adriatic coast realizing an insignificant yield of 200-300 kilos, whereas diving teams from Krapanj harvest 3000-5000 kilos of sponges per year”, says Grgo Milutin who started a private sponge harvesting business with his brother Boris during the 1980s. They were the first team to use only the light diving equipment.